It covers over 500 kilometers (310.7 mi) on one tank of fuel – and its exhaust emits nothing more than a few drops of water: The A7 Sportback h tron quattro uses a powerful, sporty electric drive with a fuel cell as its energy source, in combination with a hybrid battery and an additional electric motor in the rear. 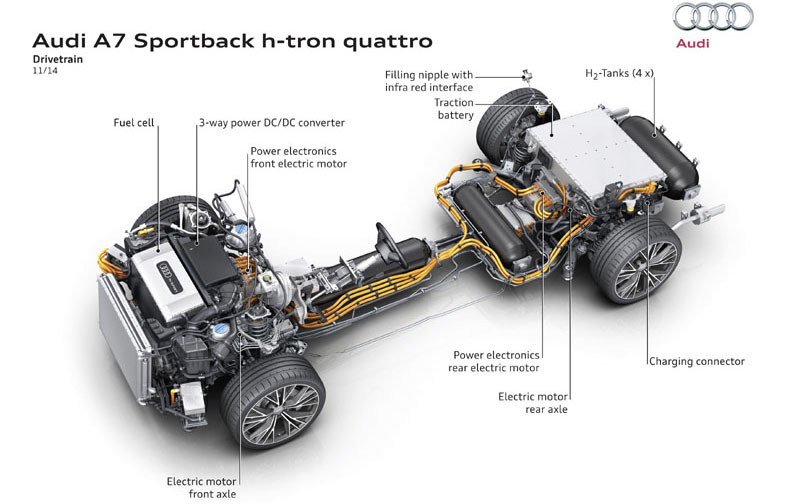 Its drive configuration makes the emission-free Audi A7 Sportback h-tron quattro a quattro through and through, with 170 kilowatts of power at its disposal – a new departure in fuel cell cars. There is no mechanical connection between the front and rear axles. 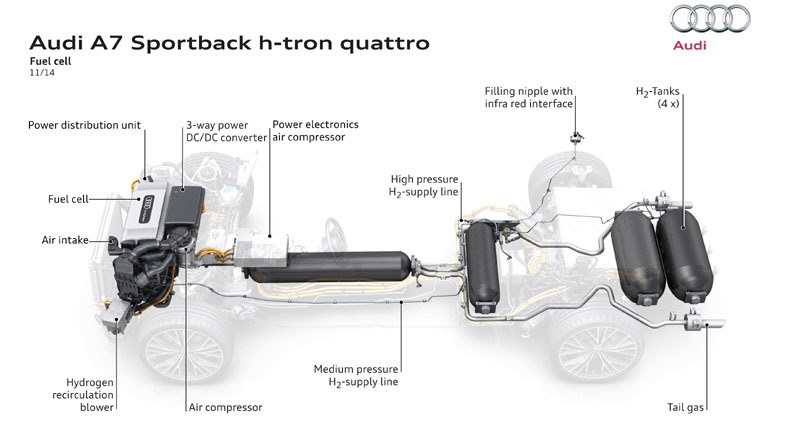 As an e quattro, the A7 Sportback h-tron quattro features fully electronic management of torque distribution. 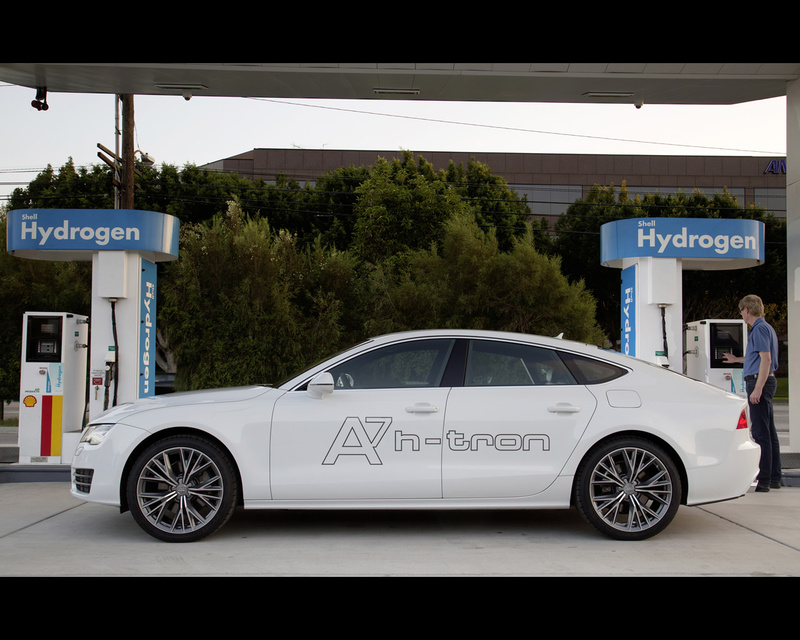 In the fuel cell mode, the A7 Sportback h‑tron quattro needs only about one kilogram (2.2 lb) of hydrogen to cover 100 kilometers (62.1 mi) – its energy content is equivalent to that of 3.7 liters (1.0 US gal) of gasoline. The tank capacity means it is capable of a range of more than 500 kilometers (310.7 mi). The “h” in the name h‑tron denotes the chemical element hydrogen. In visual terms the technology demonstrators that Audi has brought along to the Los Angeles Auto Show basically resemble the production models. As the label with the h‑tron signet reveals, this concept car now takes its place alongside the other Audi models with alternative drive principles, the e‑tron and g‑tron. Externally, there is no other evidence of the fuel cell that converts hydrogen into electrical power on board the vehicle. The crucial differences are beneath the hood of the A7 Sportback: The fuel cell in the Audi technology demonstrator is installed at the front, mirroring the conventional A7 Sportback with combustion engine. Because the exhaust system only has to handle water vapor, it is made of weight‑saving plastic. These components have a high-voltage electric drive and are powered by the fuel cell. 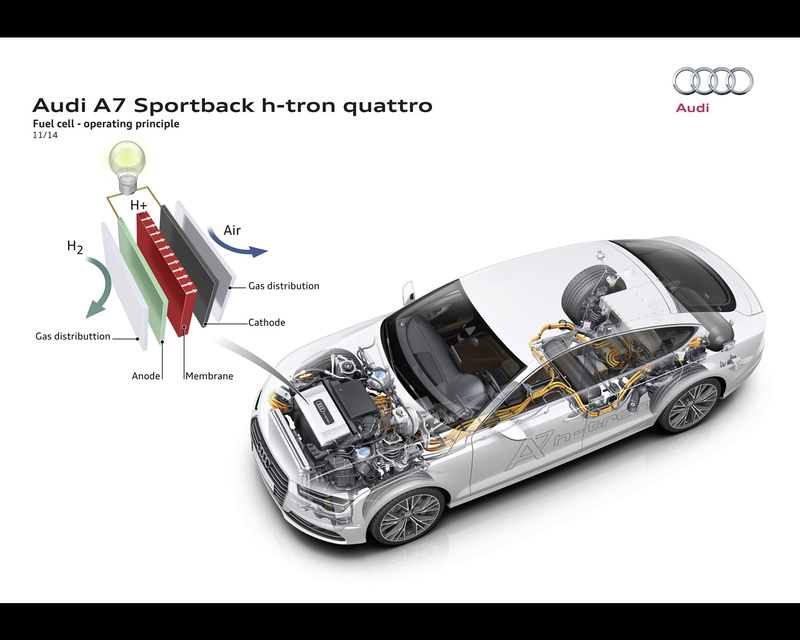 A special feature of the A7 Sportback h‑tron quattro is its plug‑in hybrid concept – this represents a logical evolution from the Audi A2 H2 and Q5 HFC test cars. It has a lithium‑ion battery on board that can be recharged from the power socket by lead; with an 8.8 kWh energy capacity, it has been adopted from the A3 Sportback e‑tron*. It is located beneath the trunk and has a separate cooling circuit for thermal management. This high‑performance battery makes the ideal partner to the fuel cell. It can store energy recovered from brake applications and supply considerable power for full‑load boosting. This paves the way for impressive acceleration, making the A7 Sportback h‑tron quattro truly live up to quattro standards. Both the front and rear axles have no mechanical connections for the transmission of power. In the event of slip, the torque for both driven axles can be controlled electronically and adjusted continuously. 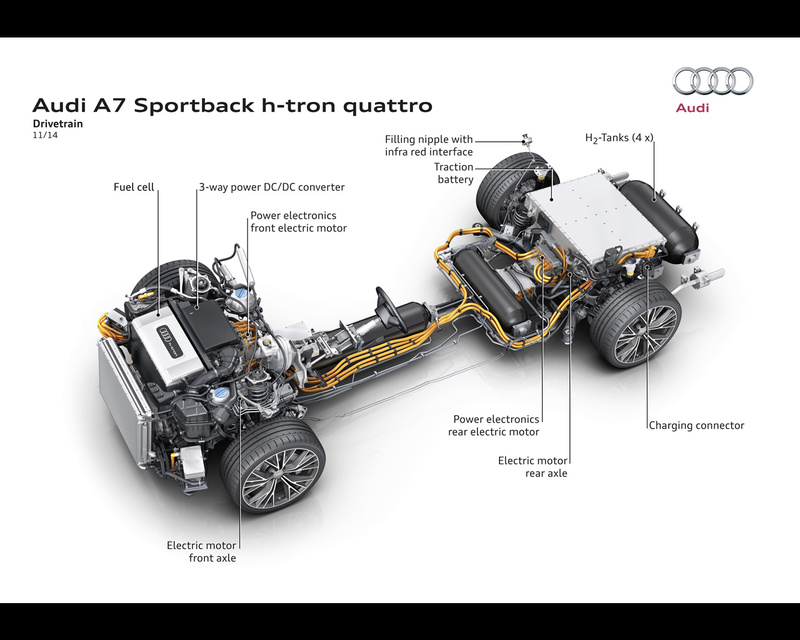 On battery power, the Audi A7 Sportback h‑tron quattro covers as much as 50 kilometers (31.1 mi). The battery in the rear of the plug‑in hybrid can be recharged by lead. Depending on the voltage and current rating, a full recharge takes between two hours (industrial power socket/360 volts) and four hours (domestic power socket at 230 volts). The battery operates at a different voltage level to the fuel cell. For that reason, there is a DC converter (DC/AC) between the two components. This tri‑port converter is located behind the stack. In many operating statuses it equalizes the voltage, enabling the electric motors to operate at their maximum efficiency of 95 percent. The two electric motors, which are cooled by a low-temperature circuit together with the voltage converters, are permanently excited synchronous machines. Each of them has an output of 85 kW, or even 114 kW if the voltage is temporarily raised. The peak torque is 270 Newtonmeters (199.1 lb‑ft) per electric motor. Driving in the Audi A7 Sportback h‑tron quattro offers the full appeal of electric drive in conjunction with the new e‑quattro. The silent propulsion is fully available from the off, and the fuel cell reaches its maximum output within one second at full load – a more dynamic response than a combustion engine because the entire drive system involves only a few mechanical components. With 540 Nm (398.3 lb‑ft) of propulsive power at its disposal the Audi A7 Sportback h‑tron quattro, which tips the scales at only around 1,950 kilograms (4,299.0 lb), races from a standstill to 100 km/h (62.1 mph) in 7.9 seconds. Its top speed is 180 km/h (111.8 mph) – a top figure for its field of competitors. The e‑quattro concept requires precise coordination of the electric motors – the technology demonstrator offers a sporty, stable and high-traction drive that is comparable to a production car with mechanical quattro drive. 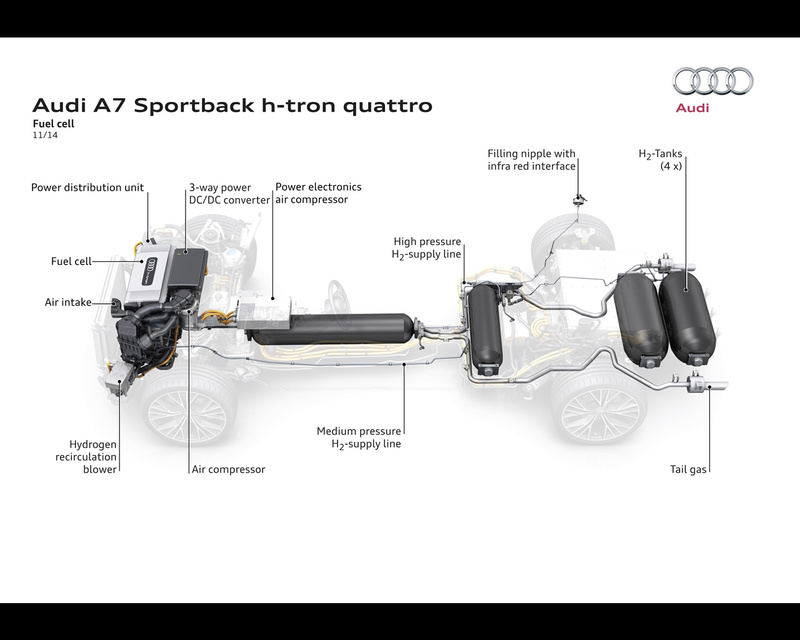 The four hydrogen tanks of the Audi A7 Sportback h‑tron quattro are located beneath the base of the trunk, in front of the rear axle, in the center tunnel. An outer skin made from carbon fiber reinforced polymer (CFRP) encases the inner aluminum shell. The tanks can store around five kilograms of hydrogen at a pressure of 700 bar – enough to drive over 500 kilometers (310.7 mi). According to the NEDC cycle, fuel consumption is roughly one kilogram (2.2 lb) of hydrogen per 100 kilometers (62.1 mi) – an amount with an energy content equivalent to 3.7 liters (1.0 US gal) of gasoline. 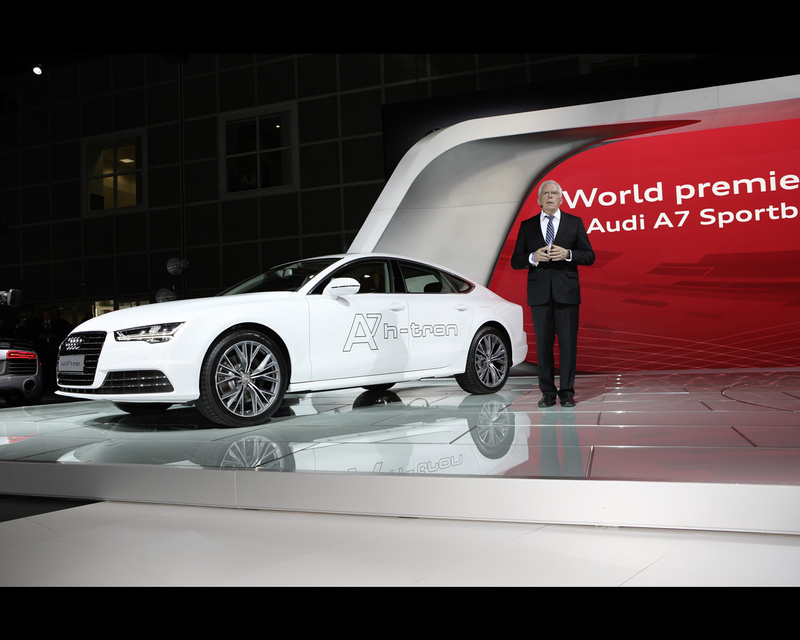 It is already the case that the A7 Sportback h‑tron quattro always travels with zero local emissions. 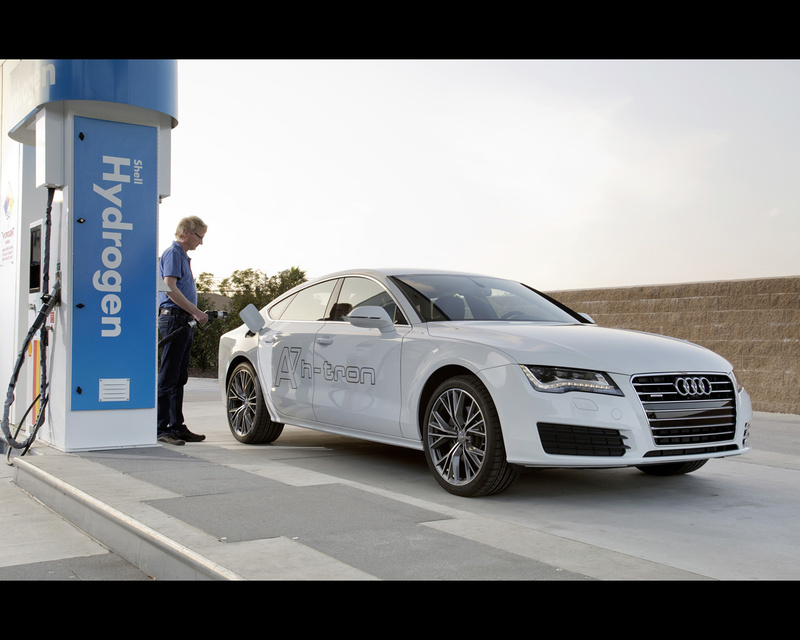 By using the renewable fuel hydrogen, it can also be used globally as a zero emissions vehicle: Since 2013 Audi has been operating a pilot plant in which renewable wind power is used to produce hydrogen by electrolysis. At present, this hydrogen is still used in an additional production process to obtain synthetic methane (Audi e‑gas). A future move to feed this hydrogen into a hydrogen supply and filling station network would make it available for refueling fuel-cell vehicles. This is a sound option for sustainable mobility with no emissions.